Even as a child, I was fascinated by plants, spending hours on my hands & knees in the yard, nose pressed to the clovers, sorrel, violet, grasses, dandelion, mosses, etc. As soon as I was old enough, I disappeared into the woods to explore a whole new world of plants: oaks, maples, hickories, mulberries, sedges, wild ginger, etc. Even though I could tell that they were different from each other, I didn’t actually know what most of them were called, as I had never heard of botany, knew nothing of scientific names, and had only the barest grasp of common names, with no one to teach me until I joined the scouts, at which point I learned a few common names like poison ivy and Virginia creeper. Once I realized that some plants had names, I also realized that that must mean that all plants have names, if only I could find someone to teach them to me (ignorantly unaware of the existence of botanical field guides). Before I actually took my first botany course, I got a job in a herbarium, a museum of dried plant specimens. Imagine my euphoria when all the plants I had seen as a child were lying there in front of me as specimens with names on them!! 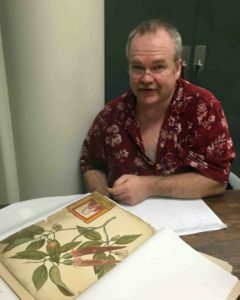 My desire to see and study new plants has led me to botanize in 49 states coast to coast and 20 countries outside the US, including a term abroad in Europe and a year living in South America. 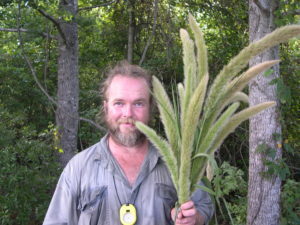 I was driven to eventually complete a master’s degree and doctorate in botany (at the University of Florida), because I wanted to keep learning about plants. This desire to keep learning about plants also led me to St. Louis for several years, home of the Missouri Botanical Garden, one of the premier botanical research institutes in the world. 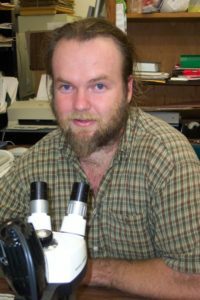 I also worked for two years as a Research Associate at the New York Botanical Garden, another premier botanical research institute, where I worked with Robert Naczi on the New Manual of Vascular Plants of Northeastern United States and Adjacent Canada. I am currently, briefly back at MoBot to wrap up the flora of India checklist project, after which I am very excited to see what wonderful new botanical opportunities come next! With Ipomopsis rubra in Florida, 1997. 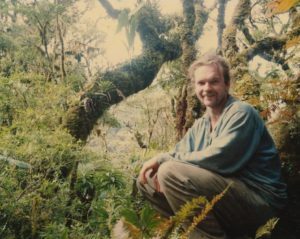 With Halenia in Ecuador, 1994. I spent years largely avoiding cameras, as they interfered with my attention on the plants. Eventually, though, I realized that photos are excellent teaching tools, and they can document plants when specimens can not be collected. Although I rarely take a picture with ‘art’ in mind, plants are often quite photogenic and beautiful. Presented here is a tiny phylogenetic cross-section sample of the 300,000+ digital images (often tied to vouchers) I have shot (and hope to someday share with the world). Crisp, diagnostic, botanical details are usually my primary goal, but sometimes color combos and textures or soft, blurry backgrounds are beautiful. The pictures here are reduced resolution, low quality images, but they’re still really nice, and I have no problem with you using them in the classroom or in a presentation. Please do not repost them online, do not print them, do not use them in a publication, do not disseminate them in any way. If you use them in a class or powerpoint for students, please make sure to credit them to me (copyright J. Richard Abbott), as you’re earning your salary in part off my work, and especially make sure to keep them behind a password-protected site available only to your students. If you would like to use my images otherwise, please contact me. I am not an artist, but I do enjoy the occasional craft project with different media, as well as taking mini-courses (e.g., one of my favorites combined paper-making with kokedama in an outdoor setting). Ever a biologist, I favor projects featuring plants and animals, albeit usually anthropomorphized or cartoony. Group photo of the Green Sox, the Missouri Botanical Garden, 2014.